Easter Sunday is arguably the most highly attended Sunday out of the entire year. More people will be attending church on this Sunday than any other. You will have children walk through your doors for whom this will be the only Sunday out of the entire year they will be in church. Therefore, on Easter Sunday it is more important than any other to teach the gospel message clearly. 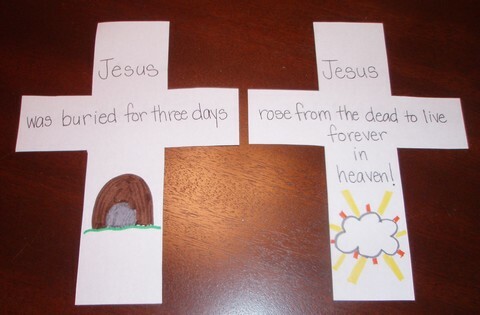 The following lesson teaches the gospel story step-by-step using a corresponding craft activity. The children will make a book in the shape of the cross. This book can then be taken home and used to tell the gospel story to their parents. 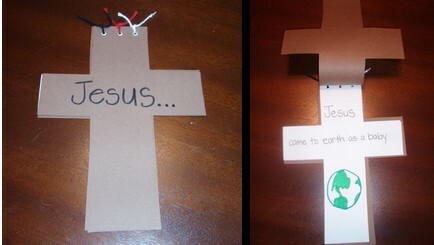 This cross shape book can be used with a variety of other lessons as a supplemental craft activity. Learning Objective: The children will make a cross shape book and be able to use it to share the gospel message with others. In this part of the lesson, the children will make their craft as you teach them the gospel story using various scripture passages. 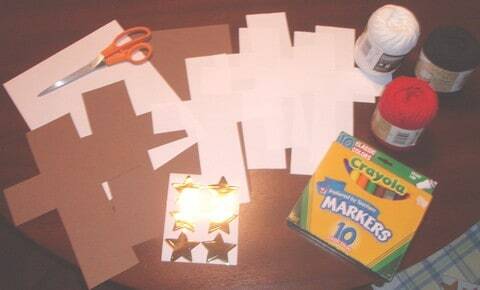 Pass out one white cross paper to each child along with a pencil and crayons. Write “Jesus came to earth as a baby” on the board for the children to copy it onto their first white cross paper. Then instruct the children to draw a picture on their white cross that will remind them of what these words say. For example, they could draw a world/globe or a baby. Pass out a second white cross paper to the children. 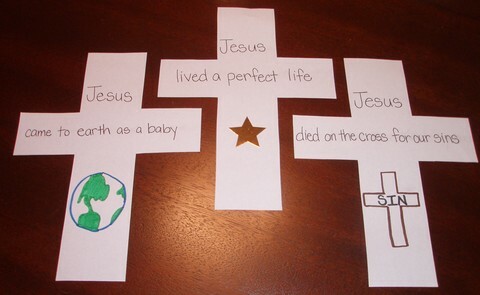 Write “Jesus lived a perfect life” on the board for the children to copy it onto their second white cross paper. Then give the children a gold star sticker to place on this second page to remind them of what the words mean. Discuss with the children how when someone receives a gold star it means they have done an excellent job. Many of them will have experienced the concept of a gold star in school. Pass out a third white cross paper. Write “Jesus died on the cross for our sins” on the board so the children can copy it. Instruct the children to draw a cross and write the word “sin” across it to remind them of what the words mean. Pass out the fourth white cross paper and write “Jesus was buried for three days” on the board for the children to copy. Instruct the children to draw a picture of a large stone to remind them of the stone that guarded the entrance to Jesus’ tomb. Pass out the last white cross paper and write “Jesus rose from the dead to live forever in heaven” on the board for the children to copy. Instruct the children to draw a picture of heaven or Jesus ascending. Perhaps they could draw a cloud with light rays shining out of it. The children will now cut out their five white crosses and their two brown crosses. The brown crosses will be the front and back cover of their books. After their crosses have been put in the correct order, they will need adult help to punch three single holes along the top of their cross book. Pass out the yarn and have the children tie a knot through each hole to bind the pages of the book together. Talk the children through the book briefly one more time using an example cross book. The children can then find a friend and tell them the gospel story using their cross book as a guide. With many visiting children on Easter Sunday many of them may not bring Bibles with them. For this Sunday it may be best to read the verses to the children and not have them turn to the verses in their own Bibles. Pass out the materials as needed. For example, give them the white cross papers one at a time. Giving all of the materials to the children at the beginning of the lesson will be overwhelming for some and may confuse others. Keeping child access to supplies at a minimum will help your lesson run smoother. Have the children write their name on every paper they receive, as they receive it, to avoid lost papers. If you only have 30 minutes for this lesson have words preprinted on the white cross papers, so the children only need to draw and cut. I love this crafi. this the 2nd Easter I’ve made this for our kids. Tony Kummer (Editor) reviewed & updated this page on : March 8, 2011 at 8:07 am. All our content is peer reviewed by our readers, simply leave a comment on any post suggest an update.